Can M Sand Used for Plastering a Wall? Many of our Constructions have this drought whether M Sand can be used for Plastering a Wall. I would like to start with a real time example which happed bank in 2013. It was a terrible time where sands where not available and I was in a tender which I have to finish in a week. We used m sand for construction and it was totally good. With no choice left i used M Sand for Plastering and it was terrible the finish looked like texture finish. We tried in different combination by adding less water etc but the result was the same. After that in 2015 I found a Real estate constructor using the M Sand for the wall plastering I said it will not work as it was a house to my surprise the sand was so soft and it gave an excellent finish now, I asked how. He said it’s a P Sand. Now the Thing you should know is there are Three Variant available in M Sand. Now as the Name Suggest P Sand (Plastering M Sand) can be used for Plastering and you get Good Result in cost wise P Sand is Little bit higher than M Sand for Concrete. But Don’t use Concrete M Sand for Plastering. While you buy a M Sand please Check it quality. If you want to know how to Check M Sand quality check our previous blog. Tavara Sands is one of the Best M Sand Manufacturers in Bangalore. Take a Glass of Water and put the M Sand in it and Shake it nicely and allow the water and sand to settle down. If you find the clay content in M Sand than its a poor-Quality M Sand. Take some sand and Taste it if you find the salty taste in the sand than it indicates the presence of salt in the content never use that sand as the salt weekend the structure. Take a Sand and Just rub it in your hand if your hand stained it indicate the earth materials which is not good for a mixture. The Colour of the sand may indicate the purity of the sand if you find any shining substance in the sand than that indicates the impurity in the sand. Tavara Sand is M Sand Manufacturers in Bangalore who provides good and pure M Sand in Bangalore and Mysore. 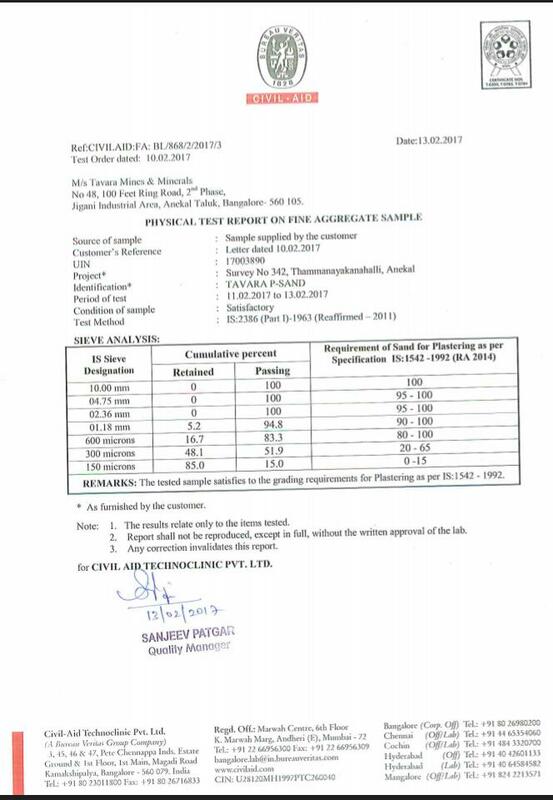 You can download the proper M Sand Lab Test results form Tavara Sands Website. I have attached the Link to Tavara Website Below. You can also check the Best price for M Sand in Bangalore in Tavara Website. Yes, compared to River sand M sand has advantages when it is manufactured properly. River sands are formed naturally so it contains many Organic Impurities like coal, bones, shells, mica, and silt and these can be detrimental to the durability of steel and concrete, whereas manufactured sand has no silt or organic impurities. Whereas M Sand this impurity are filtered and Manufactured only for constructions. So M Sand is more Stronger than River sand. Disadvantages of M Sand – It requires more Cement and Water for Constructions when M sand is Used. So, the M Sand should me manufactured Properly. TavaraSand has more than 10 years of Experience in M Sand Manufacturers in Bangalore . Visite Tavara website and Get complete price details for your location. Tavara Sands have branches in Mysore. Why Manufactured Sand (M Sand) is favored for a strong structure? structured settlement companies on Why Manufactured Sand (M Sand) is favored for a strong structure? www.post2015hlp.org on Why Manufactured Sand (M Sand) is favored for a strong structure? BocaHickory.com on Why Manufactured Sand (M Sand) is favored for a strong structure? 3win8 free credit no deposit on Why Manufactured Sand (M Sand) is favored for a strong structure? © 2017 Tavara Mines & Minerals. All rights reserved.